Well, here we are again. Another birthday, more dinosaurs. My son's fifth birthday and 3 out of 5 parties have been dino's. I'm wondering if Number 6 will be my chance to design something else for a change LOL. We (meaning I, because the kid didn't care what dino was involved as long as it was a dino) decided to go with a Paleontologist theme this year. There was an exacavation site set up with tools to dig with and everyone got to go home with the dinosaurs they found. Scroll through the party pictures for some great dinosaur birthday ideas and free printables. The list of downloads are located at the end of the blog post. Enjoy! 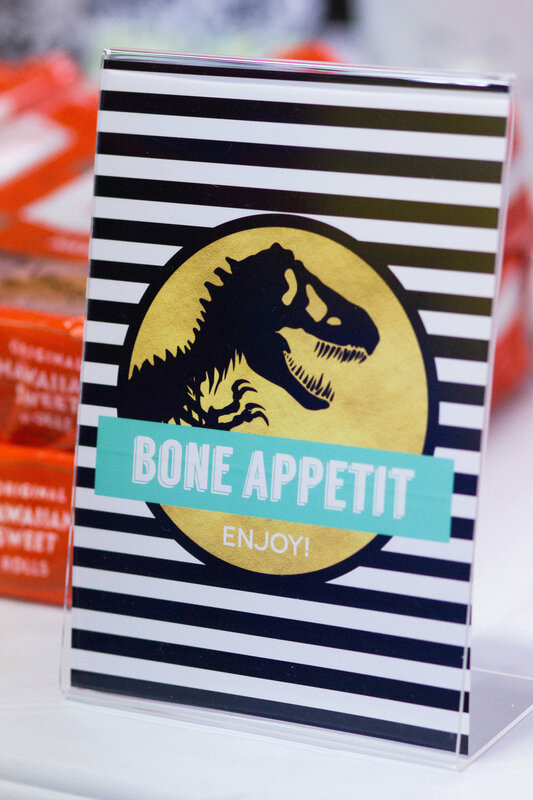 Here's some ideas for fun dinosaur themed party food. The food names in the first column are included in our free printable food cards. Download them here! We set up an "Herbivore Valley" area with veggies and fruit and cheese. A "Carnivore Cave" section with the wraps, Spinosaurus snacks, and dip. A Sweet's area with all the dino related candy, and a Watering Hole with all the drinks for the party. The little wooden food card holders are one of my favorite decor finds and I've used them for so many parties. You can find them here (af.link). I think I posted about this a few parties ago, but over on Etsy, we always get asked how we put together our cupcake toppers. You can either use lollipop sticks or party straws (cut in half). A couple of my favorite products that I use for literally EVERY single party are affiliate linked for you. Print out your toppers and cut out with a 2" or 2.5" circle puncher (both used for this party), which are sold at craft stores and online at Amazon. Tape onto sticks or straws. Boom, done! The dinosaur models were one of my favorite parts of this party. I was lucky enough to find them at Daiso, our local Japanese dollar store. For those of you that aren't stationed over here, there is a similar set on Amazon (af.link), that would probably work better. The ones that I got from the dollar store looked great, but fell apart almost immediately after they were touched. LOL. The leafy backdrop was a fun patio cover-up that they sell at a local store called Makeman (similar to home depot) here in Okinawa. The party favors were a magnifying glass and paintbrush that the kids used to dig up little dinosaur favors from a makeshift sandbox. The sandbox kept them busy for a long time and was worth the mess afterwards. The dinosaur cutout we have affiliate linked above has been a rock-star. That thing lasted me 3 separate birthday parties which made it well worth the cost. It's always a big hit with the kiddos too. And just a quick note on the absolutely adorable sign that my friend made for my little dude's birthday. We actually ended up using it as party decor after she showed up with it. 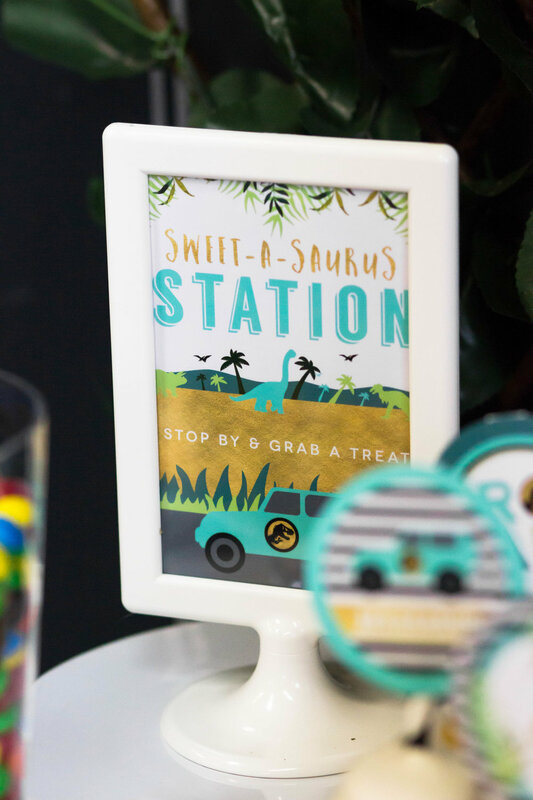 For custom items, including the invitation, dino dig sign, cupcake toppers and other printables not available as free download's you can find the entire party theme here. 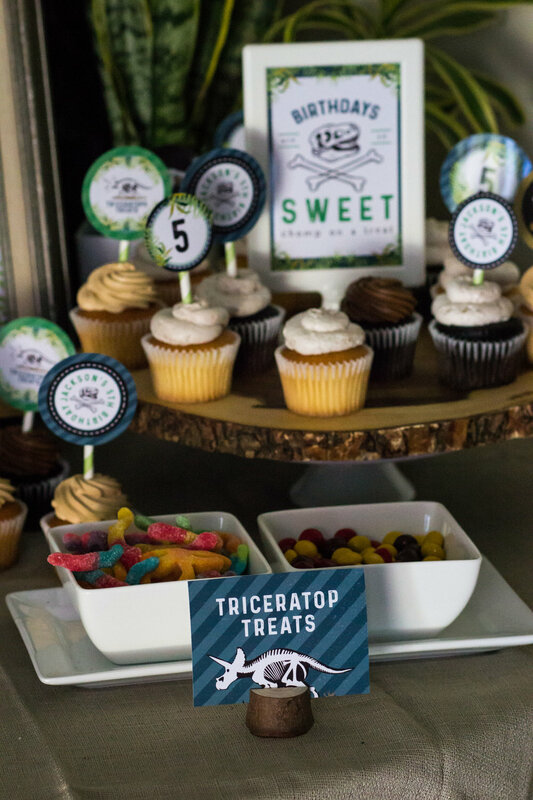 Check out our other dinosaur party themes here! Grab the printables shown in the party here! Maybe it's a boy thing, or maybe it's just my 4 year old, but Dinosaurs are life in my household. The other day I picked up a toy which I thought was a Raptor and told my son to put it away. He replied with "Mom, that's not a Raptor, that's an Allosaurus". You guys, I had to google what an Allosaurus even is. As I'm sitting here typing this, my spell check even doesn't recognize that as being a thing. But my 4 year old sure knows what it is. So here we are with yet another Dino party. I was determined to make a different dino party than you usually see and I'm sure if my son has his way, I'll be spending the next couple year's figuring out even more way's to keep a dino theme fresh. This party is a little Jurassic Park inspired to keep the kiddo happy, and a little modern and botanical to keep this mama entertained. 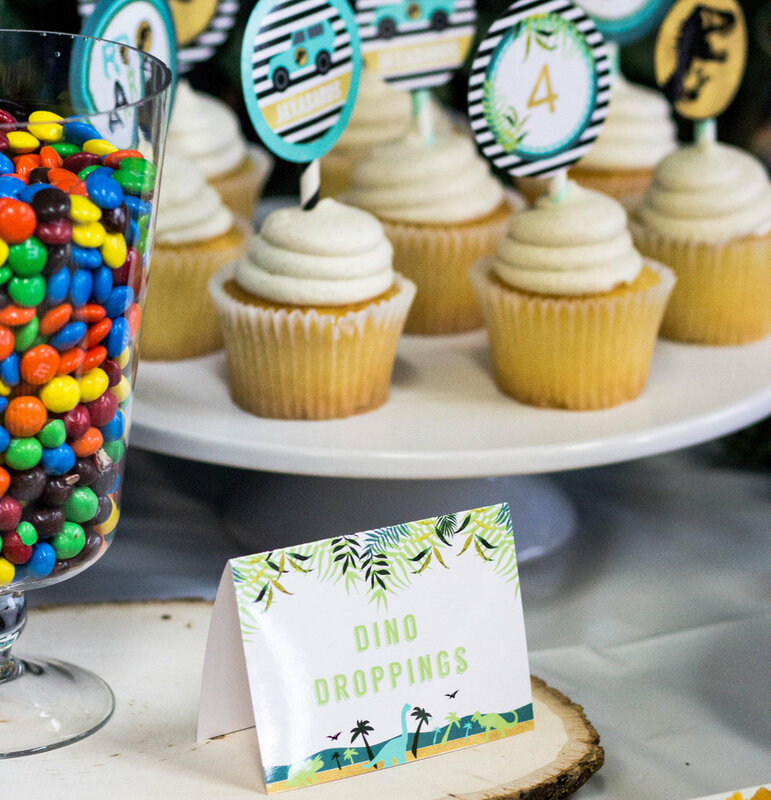 Scroll through to see all the photos, get some fun dino party ideas, and download our free printable cupcake toppers. Grab these cards in the shop! We set up an "Herbivore Valley" area with veggies and cheese and crackers. 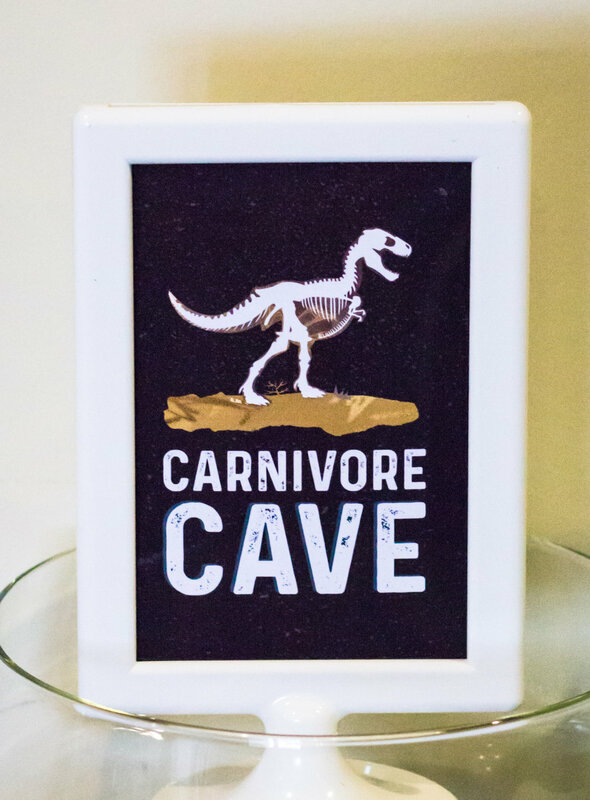 A "Carnivore Cavern" section with the meatballs, pizza, and "raptor claws" . A Sweet's area with all the dino related candy, and a Watering Hole with all the drinks for the party. I didn't get a great picture of it, but I also attempted to make fossil cookies and it was a total Pinterest fail. I'm sure I'll have this year to try again. We always get asked how we put together our cupcake toppers. It's only a few supplies and super quick. You can either use lollipop sticks or party straws (cut in half). A couple of my favorite products that I use for EVERY single party are affiliate linked for you. Grab your free printable cupcake toppers here. We've set up a download with the Roar and Trex circles. If you'd like to personalize them, they are available for purchase in our shop here. The cake was made by Giovanna of Stuck On You. The birthday boy loved that he got to keep the little dino's after blowing out the candles. The leafy backdrop was a fun patio cover-up that they sell at a local store called Makeman (similar to home depot) here in Okinawa. Grab the matching invitations on Etsy or in our party supply shop here. The photo invitation is only available on our website. Don't forget to tag your parties with #mkkmdesigns on Instagram! We put together a new party centric Insta account and can't wait to share your pictures!